This site is built around the text of the U.S. Army Uniform Regulations of 1861. However, it contains much more. 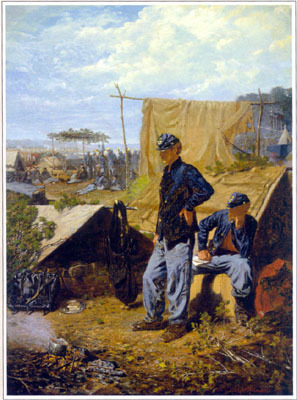 There are over 200 links to images with discussions of Civil War uniforms, insignia and other items. There is also a long bibliography of sources of information and links to other sites on the World Wide Web. This site contains information only on the Union Army. The Links Page includes other sites discussing naval uniforms. The dress of the Confederate Army would made a interesting site as well, but surviving Confederate images and material is much more difficult to acquire and Confederate uniforms are much less standardized than their Northern counterparts. Building a comparable site devoted to Confederate uniforms, insignia, and equipment would be a much more challenging and time consuming endeavor. This is a shortcut to view a list of individual discussions within the site. The site has many short discussions these are selected longer ones. Shoulder straps were an important rank insignia and a particular interest of the webmaster. All Rights Reserved. All contents of this site may not be reproduced without permission by Dr. Howard G. Lanham, M.D. I would like to thank the many people who have contributed information to this site.